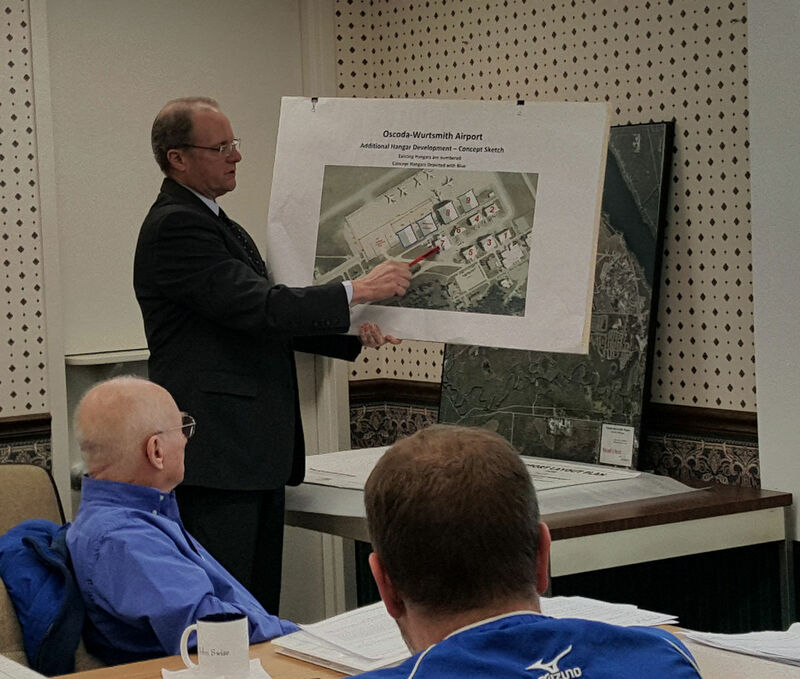 Oscoda-Wurtsmith Airport Manager Gary Kellan shows members of the Oscoda-Wurtsmith Airport Authority sections of the airport where tenants wish to potentially construct new hangar facilities. OSCODA – The Oscoda-Wurtsmith Airport Authority (OWAA) voted 4-2 to retain the services of DLZ Michigan, Inc. for $1 to conduct an environmental condition assessments on a parcel of airport property. The action was conducted Thursday during the authority’s monthly meeting. The company will work to create an assessment that will then be used to help retain grant funding from the state’s Brownfield Redevelopment program, to help clean up any possible pollution, according to airport Manager Gary Kellan. Voting against the measure were members Aaron Weed and David Daily, with Chairman Kevin Boyat and members John Swise, Rob Huebel and Mike Munson supporting the measure. Before the measure’s approval, Kellan explained that OWAA representatives sought statements of proposals from companies to conduct the work in anticipation of more construction at the airport. According to Kellan, there are areas near the currant hangar array that Kalitta Air, one of the largest tenants and employers at the airport, would like to construct more facilities to accommodate the expanding business. “The issue of water and soil contamination from PFAS (perfluoroalkyl and polyfluoroalkyl substances) was highlighted by the air force, they wanted to assure that there was a health and safety plan and a due care plan, and part of that was soil sampling,” Kellan said. He said officials at the company spent between $10,000 and $15,000 to evaluate a patch of pavement that could be the location of the next hangar, which could be as large as 100,000 square feet. With the cost of site evaluation, Kellan said the decision went forward to seek funding from Brownfield if the site needed cleaned up, in an effort to defray costs for Kalitta, which has been putting a lot of its own funding into the effort. Kellan said the first step is to get a site assessment, and then a clean up proposal, which would then be used for a grant application to Brownfield. He said the solicitation efforts resulted in five companies coming forward with proposals, including DLZ, which proposed to do the initial assessment for $1. The other companies included AKT Peerless of Saginaw for $1,250; SME of Bay City for $2,200; Envirologic Technologies, Inc. of Kalamazoo for $4,250 and Sagassar & Associates of Gaylord for $4,830. Kellan said he discussed DLZ’s proposal with the Michigan Department of Environmental Quality (MDEQ), and said he was informed that the company probably submitted the small proposal in order to compete for the potential larger project funding that could come out of the site assessment work. Munson asked Kellan if the company came recommended and Kellan said they had unique aspects that could help with work at the airport. Kellan said hiring that company would essentially get a “free first step” for the OWAA and asked for authorization to hire the company. Others on the authority, however, were not so keen to give the company the go ahead. Weed, who is also the supervisor of Oscoda Township, which has been dealing with PFAS issues for more than a year, was dubious on hiring a company that is a direct contractor for the MDEQ. Weed asked whether hiring the company would be a conflict of interest and said he did not have a lot of faith in the MDEQ, currently. “If [DLZ does] a great job, I’m all for it, but with my dealings with upper level MDEQ I have a lot of mistrust right now,” he said. Swise said there was not much OWAA officials could do with a finished report, as members were not environmental experts. He added that DLZ must know there are existing issues with the property as it would not make sense to bid out the project for $1. “It’s in everyone’s best interest to get the money,” he said. Weed said he saw a benefit to have an outside company, a non-contractor for the MDEQ, to take on the project. Dailey suggested that since DLZ was proposing to do the work for $1, OWAA officials should hire that firm, and a second on the list, to get two different reports. “Why don’t we just do two? Then we can compare our own notes,” he said. Huebel said if DLZ heard that OWAA hired two companies, they might be apt to back out of doing any work. Swise said he was confident that DLZ would do the work and said they submitted the bid because they can see “money down the road” on work. After discussion Swise moved to hire DLZ, and was supported by Huebel, with the measure passing 4-2. Dailey said he would have liked to know what two different companies would have had in their assessments. • Kellan gave a few comments on the cost of maintaining the runway during times of heavy snow, like Thursday’s snowstorm, which blanketed the county in many inches of snow. He said it could cost as much as $4,000 per snow event to keep the surfaces plowed. According to Kellan, upgrades in plowing equipment have reduced fuel costs, however. He said working with Kalitta Air, crews from that company will often help keep areas of the airport clear, such as the apron. Sometimes, like in the case of the most recent snowstorm, aircraft can be diverted to help keep crews from having to keep the runway clean during heavy parts of storms. Kellan said working with the company has helped in snowy situations over the years. “We have had situations where we needed all hands on deck and we brought their trucks into the air field with us,” he said. • Kellan informed the board that they have received a letter from the Michigan Department of Treasury asking for the OWAA to submit a corrective action plan for having expenditures exceeding revenues on annual audits. Kellan told the board he is formulating a response. He said the issue concerns the type of work, facilities and nature of the OWA. Kellan said as a response for corrective actions he said he will look at where capital assets can be adjusted to avoid the issue. Member Swise said if the agency had actually read the audit they would have seen the issue Kellan described.